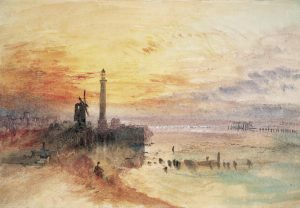 The annual January exhibition of Turner watercolours at the National Gallery of Ireland this year is a conversation across the centuries. Good Morning Mister Turner – Niall Naessens and J.M.W. Turner – brings together the gallery’s Vaughan Bequest of 31 watercolours and a series of etchings and drawings by the Brandon based printmaker who worked as master printer in the Graphic Studio for many years. Naessens approaches Turner’s works obliquely, not as images to be imitated or interpreted, but as a means of looking at the landscape. 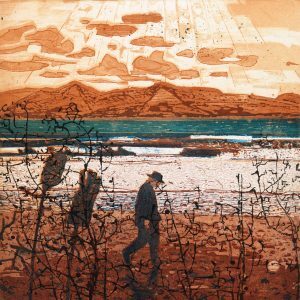 He has created an artists book with 13 small etchings in a yellow box, eleven framed prints and five drawings for the exhibitions. This entry was posted on Monday, January 1st, 2018 at 8:10 pm	and is filed under ART. You can follow any responses to this entry through the RSS 2.0 feed. You can leave a response, or trackback from your own site.